The "May gray" has arrived just in time for Memorial Day weekend. While beachgoers hoping for sun may be disappointed that the heat spell petered out before the holiday, the return of the marine layer is a blessing for native plants that have adapted to depend on the fog as a source of moisture, and any source of moisture is welcome during this prolonged drought. But despite the dry conditions there are still springs flowers blooming, you may just need to look a little harder for them. 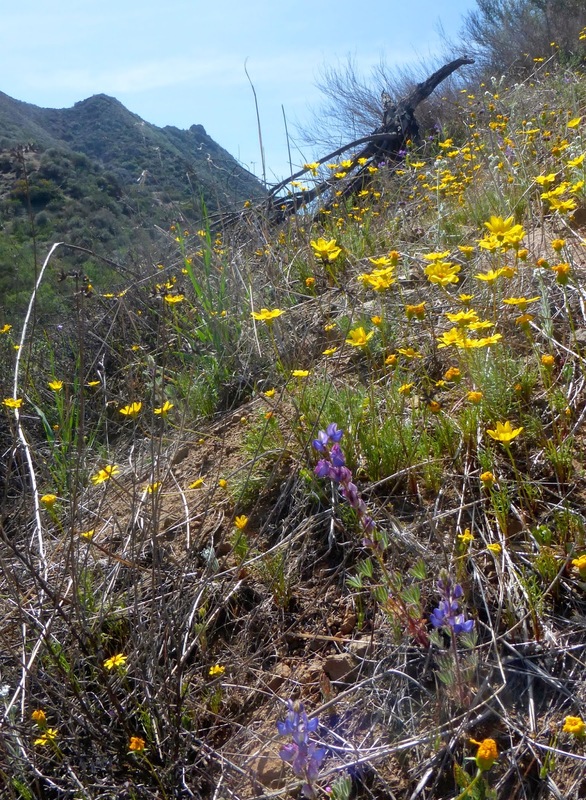 I wrote an article on wildflowers for the April 21 issue of the Malibu Surfside News that included a short list of wildflower field guides and online ID resources. Many of the flowers in that article are still blooming. You can read more about them and other late bloomers below. 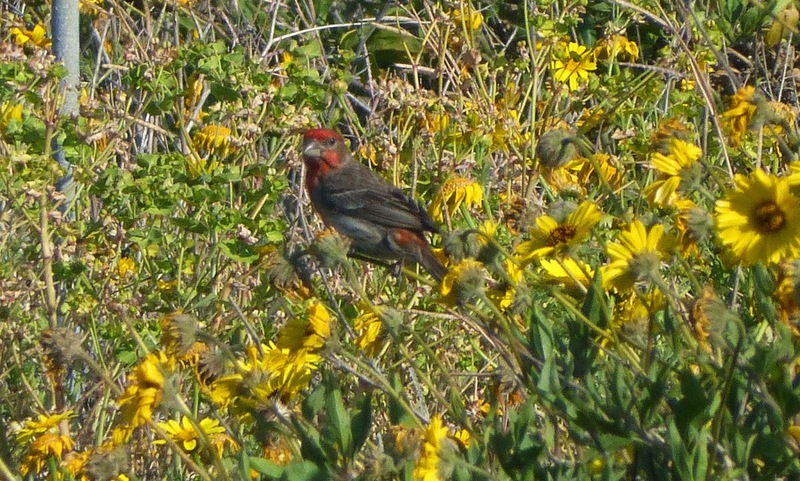 There's always something to see at the Point Dume Natural Preserve, even during the dry season. The flowers in this photo—crown daisies, wild radish and spurge—are all invasive non natives, but they're still beautiful to see. There are still plenty of native wild flowers here, too, if you know where to look. At the Point Dume Headlands the spectacular giant coreopsis flowers have finished blooming, but bush sunflowers, Encelia californica, still provide a golden background. The seeds, rich in protein and oil, draw a variety of birds, including this house finch, whose beak is perfectly adapted to seed cracking. Bush sunflower grows easily from seed and is a good plant for coastal gardens, although its stems break easily, giving it its other common name, brittlebush. 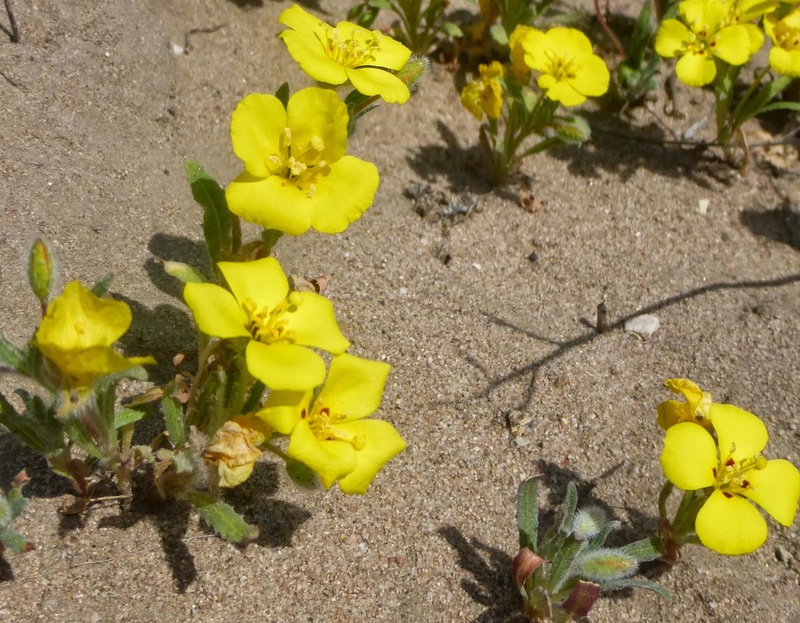 Beach evening primrose, Camissonia cheiranthifolia, grows in the sandy soil at Point Dume. A formidable root system helps beach primrose survive life on the sand. This plant has begun to recolonize the sand dunes at Westward Beach. It also flourishes on the big sand dune across from Thornhill Broome State Beach. 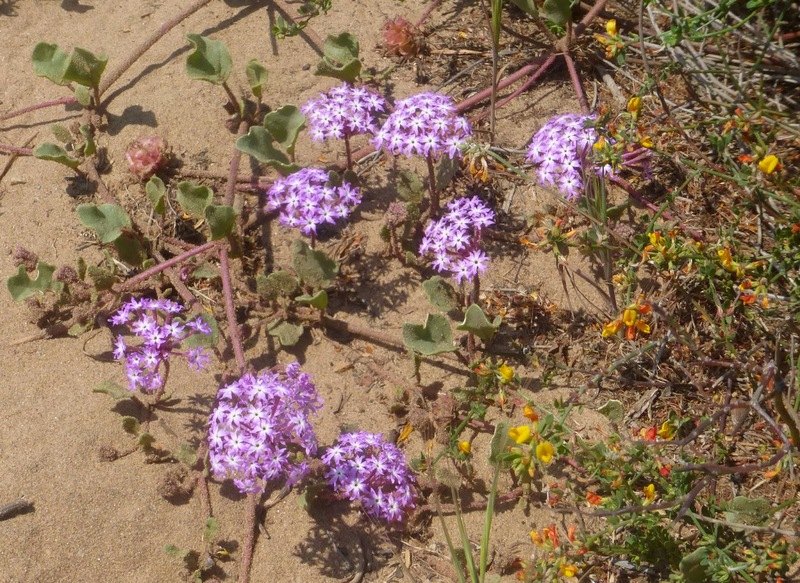 Purple sand verbena, Abronia umbellata, looks delicate, but its thick succulent leaves and stems are covered with tiny sticky beads that help the plant capture and store water, enabling it to live on the sand. The flowers have a sweet fragrance. The yellow and orange flowers growing nearby are deerweed, a pretty plant with the decidedly unattractive Latin name Acmispon glabera. Deerweed is a native member of the pea family. 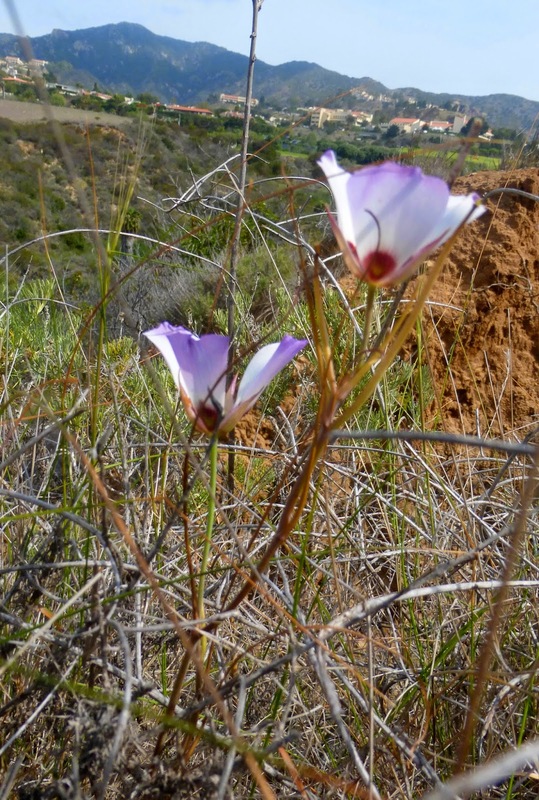 It's one of the most ubiquitous late spring-early summer flowers in the Malibu area. Butterfly weed would be a better name for this plant. They're supposedly slightly toxic and don't seem to appeal at all to deer, but they are wildly popular with butterflies and bees. This sunflower is smothered in wishbone bush flowers. Like the sand verbena, the wishbone bush, Mirabilis californica, has thick leaves to store water and sticky hairs that help the plant conserve moisture. It gets its name from the way the flowers stamens, arranged in pairs of two, supposedly resemble wishbones. However, these flowers aren't open enough to reveal the secret. ...But once you find your way into Bluffs Park Open Space, there's all kinds of possibilities. 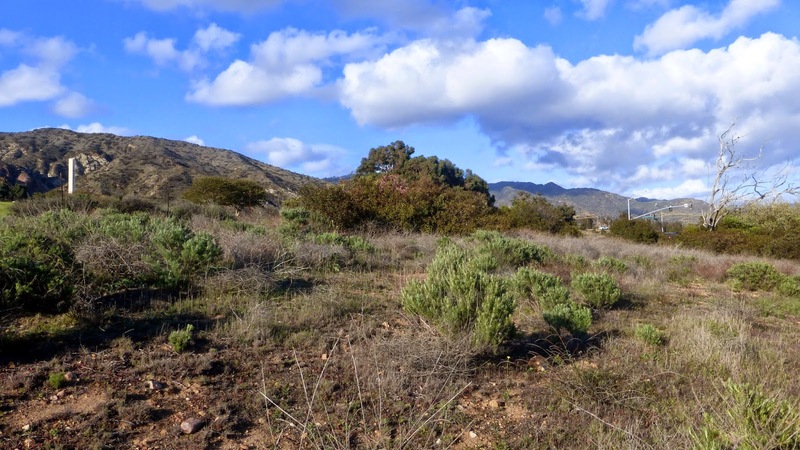 It's not a big park, but it offers wildflower enthusiasts a mix of Coastal sage scrub, native grassland, laurel sumac chaparral and even some riparian habitat. It also has spectacular views of the ocean and the mountains. 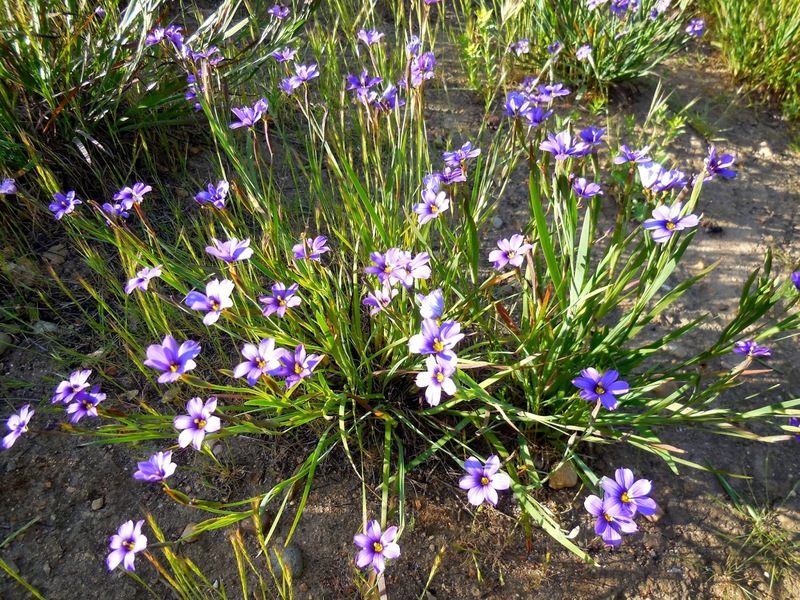 This is blue-eyed grass—it's actually a member of the iris family and not a grass at all. It's the most conspicuous Bluffs Park flower. In a wet year, there are acres of this delicate violet-colored flower. This year they are somewhat sparse but still present. They seem to like the same niche inhabited by the much rarer native needlegrasses. It may not look like much, but native needlegrass plants can live for more than 100 years and often have root systems that can stretch for 20 feet, enabling the plant to weather drought. This is purple needlegrass. 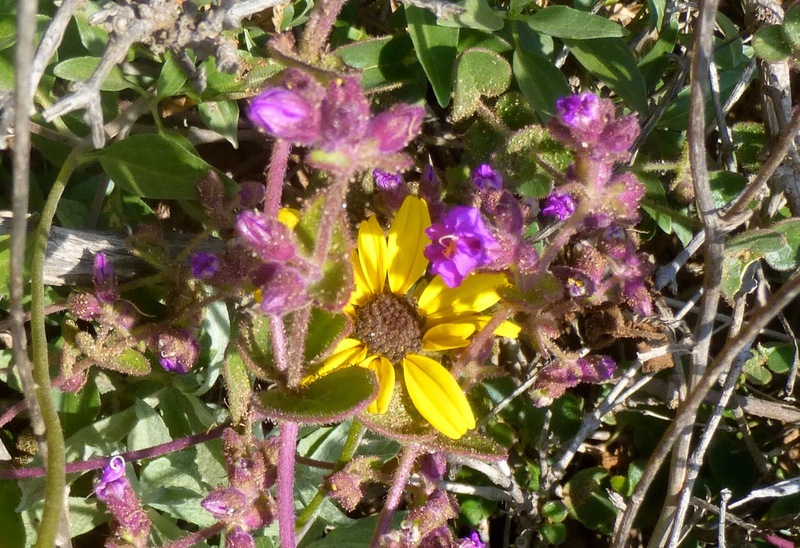 Its seeds were reportedly an important food source for the Chumash. It's vanishingly rare to find this grass growing on a coastal bluff in this era of intensive development, and the Coastal Commission identifies native grassland as significant ESHA—environmentally sensitive habitat area. 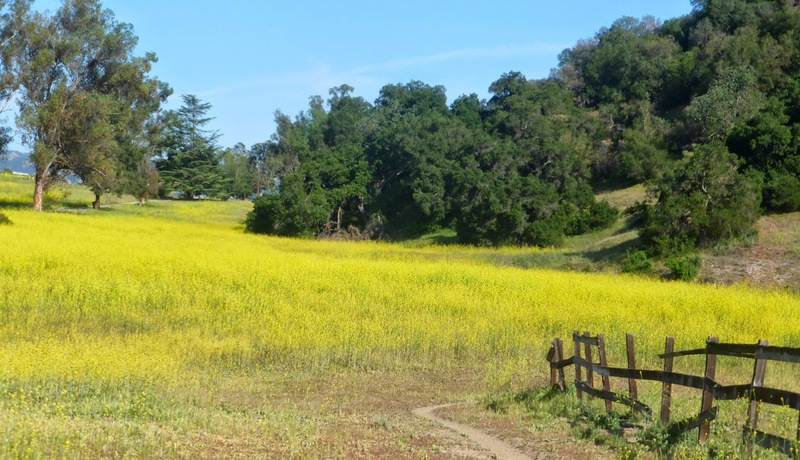 The California Natural Diversity Database lists needle grass habitat as "a community needing priority monitoring and restoration," and considers grasslands with 10 percent or more cover by purple needlegrass to be "significant." We're lucky to have this remarkable example of native grassland at Bluffs Park. 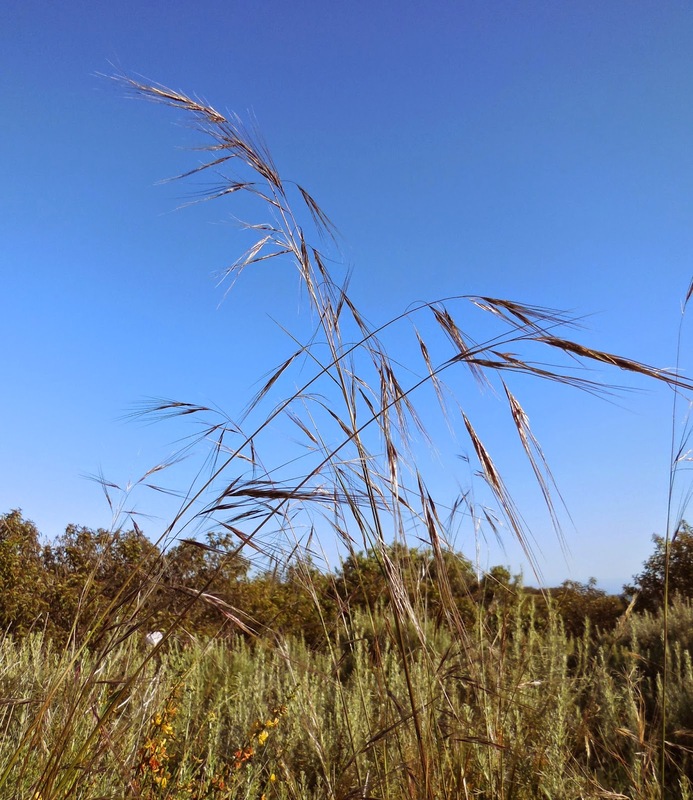 Needlegrass has been planted at Malibu's Legacy Park in an effort to establish a new coastal prairie, but the plants at Bluffs continue to survive, relatively undisturbed, in their original habitat. 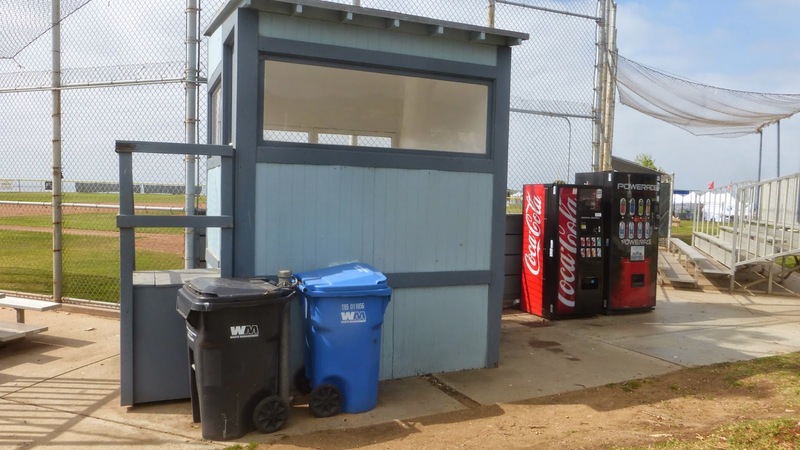 This is one of the real stars of the show at Bluffs Park. 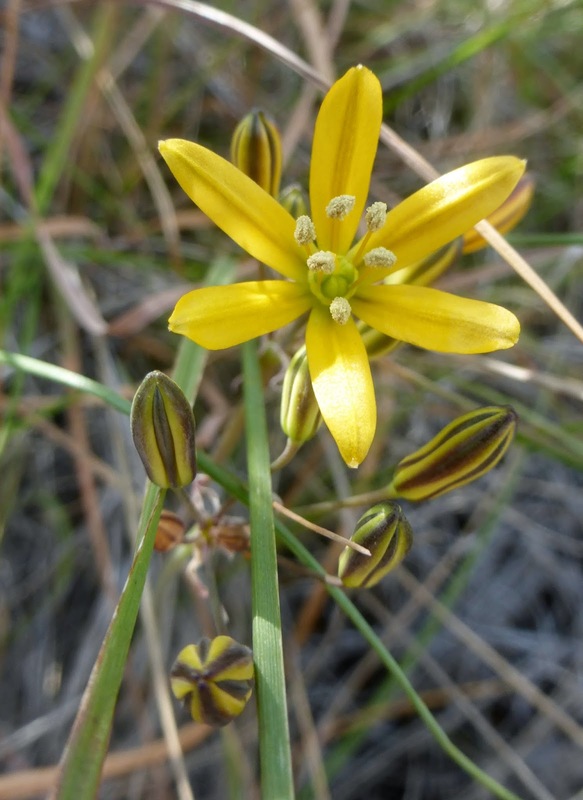 This delicate member of the brodiaea family is Triteleia ixoides, also called golden brodiaea, yellow star lily, and pretty face. It's a bulb, which helps it weather drought years. Where you find Triteleia you sometimes also find a much rarer wildflower, the Catalina Mariposa. Bluffs Park has a large population of this threatened species. 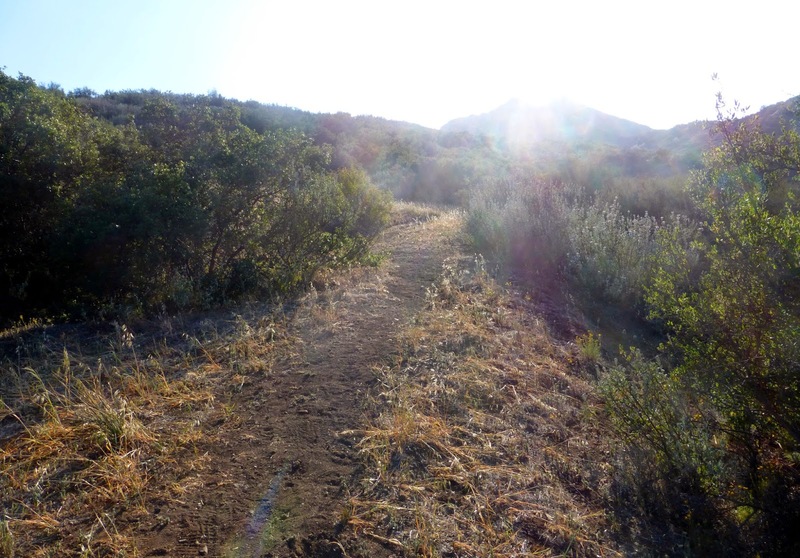 An Environmental Impact Report prepared by theSanta Monica Mountains Conservancy before they traded the park to the City of Malibu for Charmlee Wilderness Park, identified more than 200 plants. I found this mariposa perched on the edge of a bluff. Unfortunately, Catalina mariposas, unaware of the difference between parkland and housing tracts, also grow on the Crummer property next door to the park, soon to be developed into McMansions. It is to be hoped that whoever does their EIR is aware of the potential treasures under foot. 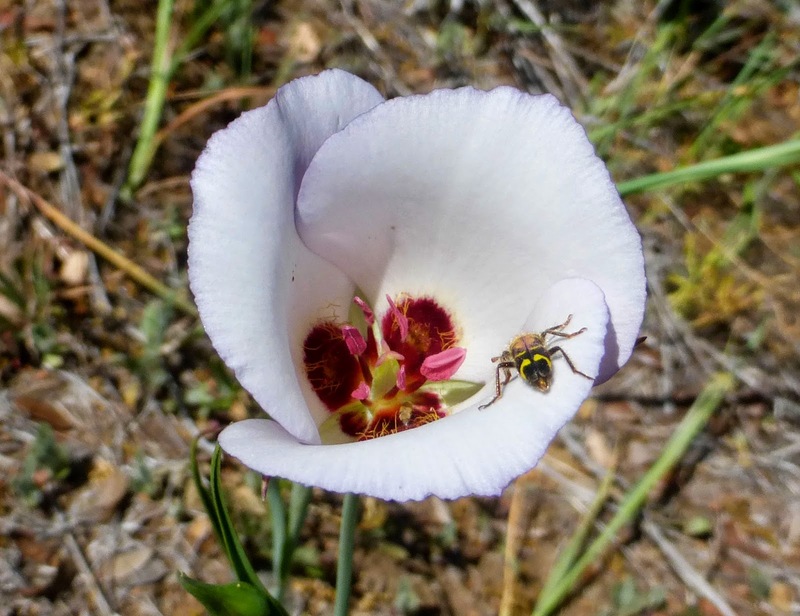 Here's a closer look at Calochortus catalinae, complete with a native pollinator. Several other species of mariposa lilies grow in the Malibu area, including a bright yellow variety, but the Catalina mariposa, with its distinctive red spots and violet-tinged white petals, is the rarest. 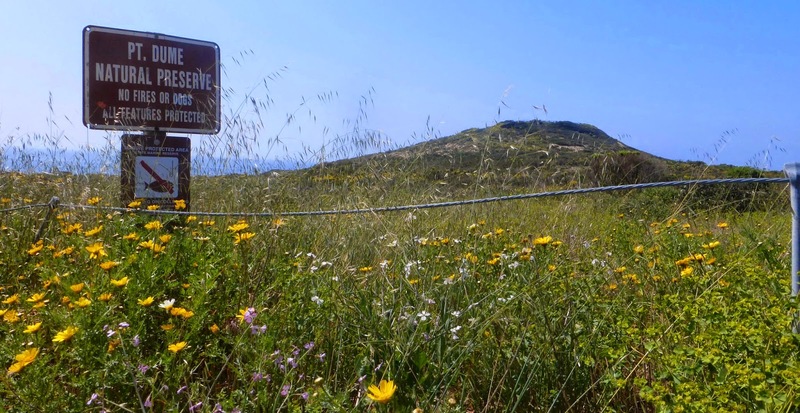 Bluffs Park and the Point Dume Headlands offer a new adventure every time one takes the time to walk there, but there are remarkable things all around, and wildflowers everywhere this time of year, even by the side of the road. It's worth slowing down and taking a closer look. My mother and I stopped on our way home from Agoura Hills on Kanan Dume Road to admire this view. The small yellow flowers are goldfields, Lasthenia california. They once covered miles of the local mountains—and still do in areas like the Carizzo Plain. The blue is lupin. "We don't always realize how lucky we are to see this every time we go shopping instead of subway tunnels and city streets" she said to me. 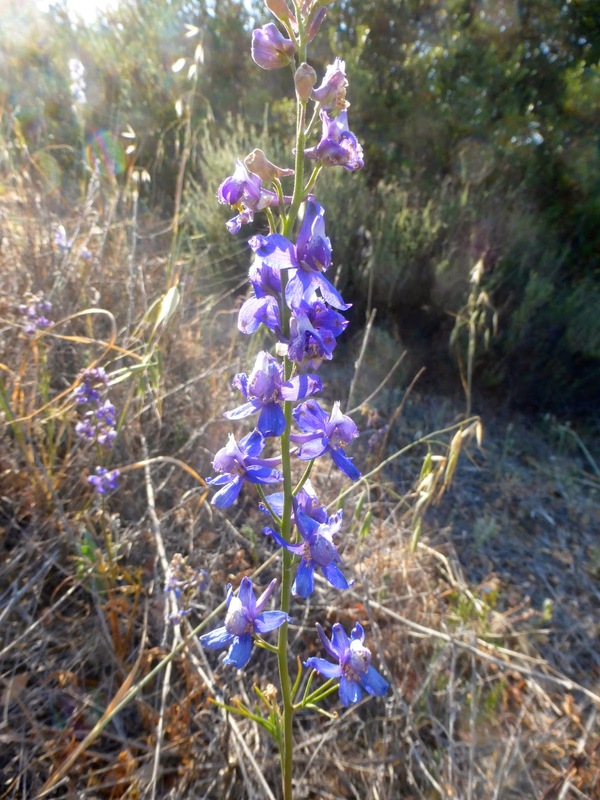 This blue larkspur was growing along the roadside nearby. Here's the trail leading up from Kanan to the top of Ladyface Mountain, golden with tarweed and the star-like flowers of triteleia. There wasn't time that day to for a walk. I can't help wondering what we might have missed. Carpets the valley with russet. Because the earth has grown so parched. —Madeleine Ruthven, Yerba Buena, 1934.